When installation is complete, we can start the program. The screen shown below appears. This is called the Nag screen. Note: This screen isn't present in the registered version. This screen gives us information about the trial period, and in this case we can start the program another 49 times out of the possible 50. After starting the program 50 times, this shareware program will no longer work unless a registration code is entered. This screen also has a delay of 5 seconds before the OK button becomes active. Once the button is active, just click on it. 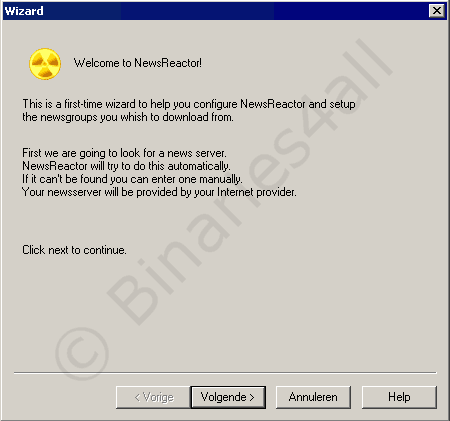 Welcome to the NewsReactor installation wizard. We are now going to set this program up to use our news server. We will need details of our news server such as server address, username and password. 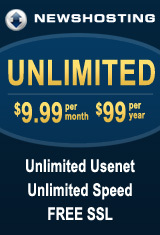 These are provided by your ISP or Payserver. Click on Next.In our screenshots it is called Volgende, which is Dutch. This information has to be entered in the next screen. In this tutorial I will use the my provider’s news server, which is ‘@home’. The server address is testnews.home.nl, which I enter in the Newsserver field. If you have to provide a username and password, enter these too. In the case of @home we don’t. As you can see, we don’t use the Auto Search but enter our server details manually. Do feel free to try it, though. When we click on Next , the program will verify the connection with the news server entered. If the data entered is correct, the program will respond to tell us our news server has been detected. Let’s click on Next. In the next screen we can search for Usenet newsgroups on our server. Click on Scan Usenet newsgroups to begin the process. 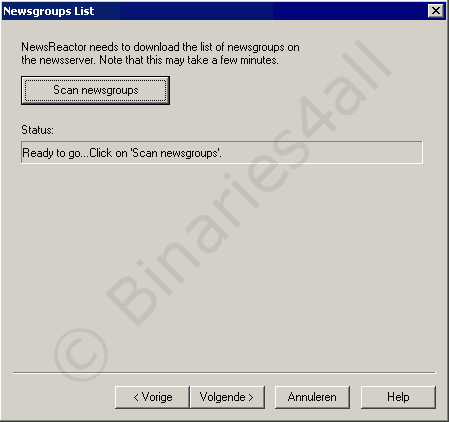 NewsReactor will now download the group list from our server. This process is shown below. The number of groups can be considerable, so we might have to wait a while. In this case the server contains over 48,000 groups. Be patient, even if nothing seems to be happening. When the group list has been downloaded, the text Ready will appear in the status bar. Click on Next to proceed. In the next screen, all the groups downloaded from our server will be shown, including the text groups. However, we are only interested in the alt.binaries. * groups, because they contain the posts we are looking for. Just enter ‘binaries’ in the Keywords field to filter these groups from the list. The other groups will be hidden. Now we can select the groups that we want to download from. The list of selected groups can easily be adjusted later on. In this tutorial we are going to download from alt.binaries.nl, this being a popular group for Dutch binary files. First, enter this group in the Keywords field, as shown below. As you can see, only the groups containing alt.binaries.nl are shown. We mark alt.binaries.nl and click on Next. In the next screen we will have to enter our default download folder. The default setting is C:\Download but feel free to change this. Click on Browse and select the folder. When you have selected the desired location, click on Next. 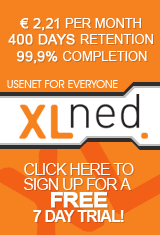 I chose "D:\Nieuwsgroepen", which is Dutch for "D:\Usenet newsgroups". Congratulations! We have finished configuring NewsReactor and are ready to download from Usenet. Later on in this tutorial I will discuss how to add additional servers and groups. Just click on Finish to complete configuration. Now the program is actually starting. First of all, the Tip of the Day is shown. You might want to read these. If you don’t want them to be shown at startup, uncheck Show tips on Startup. We are now ready to begin downloading with NewsReactor. To the next chapter: Using the program.